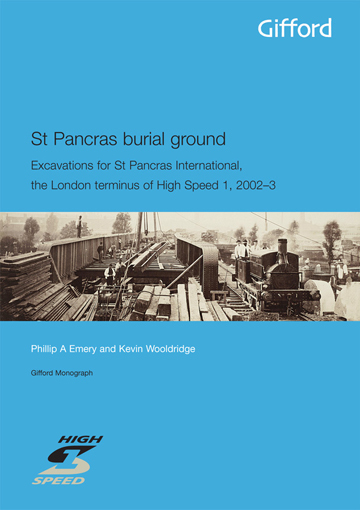 St Pancras Churchyard was extended several times in the post-medieval period, culminating in the creation of the ‘New Burying Ground’ in 1792, with the last burial occurring in 1854. This study focuses on the southernmost ‘Third Ground’, where 1383 burials were recorded archaeologically. Analysis included reconstruction of coffin stack sequences within known burial rows, innovatively illustrated in 3D. A sample of 715 burials underwent full osteological analysis, revealing a heterogeneous population buried during a time of rapid urbanisation and industrialisation. Preservation of human bone and coffins was exceptional, with inscribed coffin plates linking many burials with biographical detail. Identified individuals include refugees from the French Revolution, most notably three aristocrats and two prelates. Gifford (part of Ramboll) 2011. ISBN 978-0-9569406-0-5. Hb 225pp + CD-ROM. 180 bl&wh and col ills.